The barricade scene in Les Misérables — the musical based on the novel by French poet and novelist Victor Hugo — is a powerful mix of song and drama. Loosely based on the 1832 Paris uprising, idealistic revolutionary students set up a street barricade and fight government troops to the bitter end. W. Navarre has managed to capture this scene fantastically with the large central barricade and a detailed backdrop showing narrow Parisian streets. The barricade looks the part as a jumbled collection of brown coloured LEGO wheels, ladders, furniture, windows and bricks. There’s a lot of detail to be found relating to the musical version of Les Misérables, I particularly love details like the tear in the French flag, the lantern and the fatally wounded Gavroche. 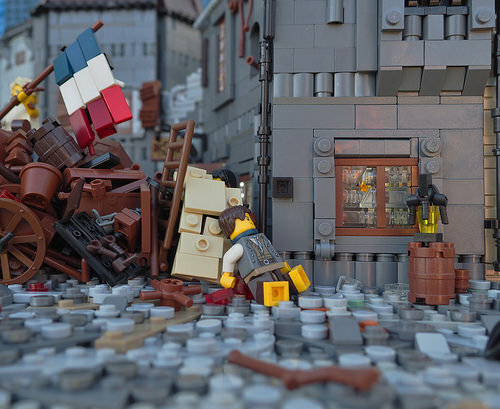 You can see more images of this build and the other Les Misérables-themed LEGO creations in his album on Flickr.